A statue of an angel is seen at the Hidalgo Cemetery on Monday April 2, 2018, in Hidalgo. The number of above-ground crypts, ornate monuments and ironwork fences reflect the Spanish-French influence in the area. English, French, Spanish and German tombstone inscriptions are indicative of the city's ethnic mixture. 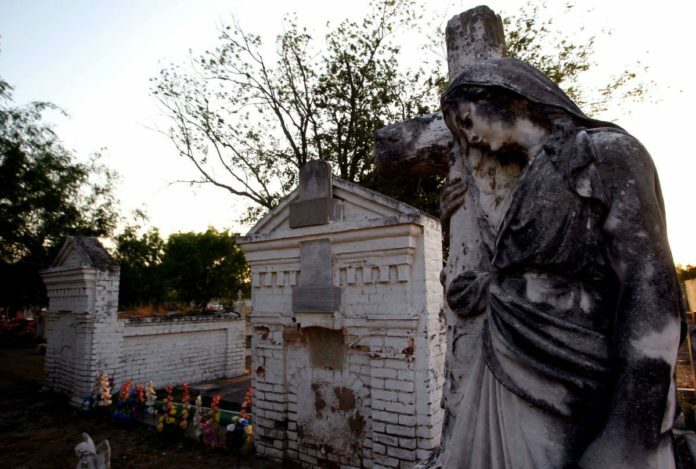 HIDALGO — More than 130 years worth of history lies within the grounds of the Hidalgo Cemetery, and this weekend some of its secrets will be unearthed. Since 1894, more than 1,000 people have been buried at the Hidalgo Cemetery, including renowned pioneers, war heroes and even would-be-assassins. Their stories will be shared at 2 p.m. Sunday at the Museum of South Texas History. Esther Camacho, a reference librarian at the McAllen Public Library, will present “Hidalgo Cemetery 1884: Hidalgo’s Hidden History” as part of the museum’s Sunday Speaker Series. Camacho, who teaches genealogy classes at the library, will explore the history of several of the most famous figures who were buried there, including Elder B. Barton, who fought in the Battle of San Jacinto, the decisive battle of the Texas Revolution. His grave is still very much visible at the cemetery, where he was buried alongside his wife. A tall white tombstone marks their final resting place. Camacho will also recount the story behind Franciso (Panch) Garza, the man who plotted to kill John Closner, an Hidalgo County developer who is still a household name thanks to the roadway named after him in Edinburg. “Numerous veterans are buried here, with service from the Texas Revolution to modern conflict,” reads a plaque from the Texas Historical Commission on display at the burial grounds. Jose Luis Martinez is one of those. The 21-year-old seaman apprentice died in 1989 in the USS Iowa explosion, where 46 other crew members were killed when 550 pounds of gunpowder exploded inside the battleship off the coast of Puerto Rico. And while some of the most prolific figures buried at the Hidalgo Cemetery will take the center stage Sunday, across the county in Edinburg, is another historic cemetery with its own endeavor to remember the dead there. Archaeology students at the University of Texas Rio Grande Valley have partnered with Hidalgo County to help identify the impoverished who were buried at the county’s pauper cemetery in Edinburg. The students are currently plotting the land and hope to develop an app that will help family members and the public locate the final resting place of their loved ones, according to a news release from UTRGV.